Pencils and notebooks. Pens and glue sticks. Binders and calculators. Sometimes it seems as though the list of required school supplies for your child grows longer each year. The National Retail Federation has found that parents spend on average more than $95 each fall on school supplies, that’s not even counting the $246 spent on new clothes, $129 on new shoes, and almost $220 on electronics. So how’s a parent supposed to keep their child well equipped without dipping into that college savings fund? Here’s the good news: With a bit of planning and preparation, you can provide your child with all the supplies they need to succeed in school without breaking the bank. Save money on school supplies by following these four simple tips. Before heading to the store, classroom supply list in hand, go “shopping” in your own cupboards, closets and especially that catch-all junk drawer. You may be surprised to find an abundance of unused pens, pencils, notebooks and other supplies you didn’t even know you had. Although it’s tempting to pick out a shiny new lunchbox or a backpack featuring the most popular cartoon character of the week, reusing last year’s models will save you money on this year’s school supplies. After all, unless a backpack is broken in some way, it’s still fine to use. The same goes for lunchboxes, rulers, calculators, and even pencils and pens. There’s no rule that says everything has to be brand new each fall. If your child really wants a new backpack or lunchbox, get creative and decorate the ones you already have with stickers, patches and trims. Turn it into a fun project that can make your child proud to carry the new-old backpack or lunchbox to school. Don’t wait until the last minute to purchase school supplies. Instead, look for sales at the end of the school year and through the summer. Keep an eye out for sales flyers! When you notice great deals on different items at multiple stores take the flyers to the stores with you and ask if they’ll match prices – if they will, you may be able to save on gas, too. Swapping with other parents is a great way to save a few bucks. Sites such as swap.com let you browse what others have available to swap, so you can then swap your own unwanted items. 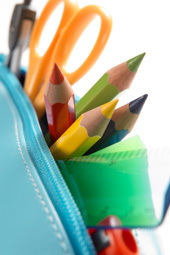 Alternately, set up a school supply cooperative with other parents in your child’s class. Buy large amounts of each school supply item in bulk, splitting the cost among the parents. This approach can make a big difference on your school supply budget. What school supply item do you spend the most money on each year? Share your feedback with us in the “Comments” section below.